Lucy decides to rent out Kim's vacant room for extra spending money, but is shocked when the rental agent sends her a very eccentric man, Kermit, who has quite sour disposition. Lucy soon chooses to break the lease. 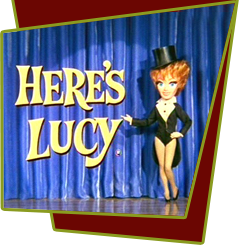 Since she is forced to keep him because of the lease he signed, Lucy schemes to scare him away by pretending to be in love with him. In the end Harry must play Lucille's long lost husband to get rid of her annoying tenant. Special Notes: Jackie Coogan was the child actor who sued his parents for $4 million and who the subsequent child actors law was named after; he played Uncle Fester in The Adams Family.